The conclusions highlight the importance of taking action at different levels to enhance community-based support and care with the aim to enable independent living and invite different stakeholders to actively engage in this endeavour. The text, tabled at the initiative of the Estonian Presidency, was finalised by the Social Questions Working Party after preparatory input from the Social Protection Committee (SPC). The text of the Council Conclusions was tabled at the initiated of the Estonian Presidency of the Council of the EU with its main aspects being a subject of the discussions at the Dignity + Independent living = DI Conference organised by the Estonian Presidency in October 2017 in Tallinn. The Opening Doors for Europe’ Children campaign acknowledges the EPSCO Council’s conclusions ‘Enhancing Community-based Support and Care for Independent Living’ as the visible commitment towards adequate reforms of the care systems and transition to the needs-based support in the communities. This transition should be embedded in the broader systemic reform of the social welfare and child protection and by only this way we will achieve long-term results and inclusive societies that will not need institutional care settings anymore. We welcome that the Council’s conclusions make reference to the comprehensive strategies and the need for stronger investments to develop modern high-quality community-based services and increase support. We call on the Member States to develop deinstitutionalisation strategies and action plans in line with the UN Convention on the Rights of the Child (UNCRC), the UN Convention on the Rights of Persons with Disabilities (UNCRPD) and the UN Guidelines on the Alternative Care for children. 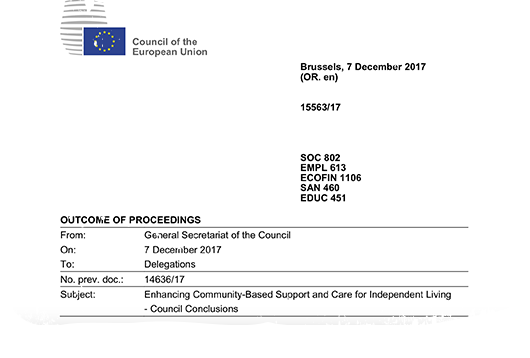 We call on the European Union to follow up on these conclusions and the Member States to take concrete actions towards the transition from institutional to family- and community-based care built around the needs-based support in the communities. Institutional care is a pan-European problem and should be addressed by all Member States as one. Children across the EU enter the child protection system due to abuse or neglect, disability, poverty, discrimination or migration status. Poverty, in combination with the lack of support services in the community, can lead to children’s institutionalisation. Children with disabilities are overrepresented in institutions across Europe. There is also strong evidence suggesting that children with minor or even no disability become disabled as a direct consequence of the damage inflicted by institutions for children. In addition, Roma children are over-represented in institutions in Central and Eastern Europe and due to the recent ‘migration crisis’ refugee, migrant and unaccompanied children are being institutionalised and discriminated against their peers due to their migration status. Member States should subscribe to the principles of Necessity and Suitability of the UN Guidelines for the Alternative Care of Children. The principle of Necessity embedded in the CRC and the Guidelines dictates that no child should be placed in formal care when measures could be taken to ensure their care and protection in the family or other informal environment, e.g. within the extended family. The principle of suitability embedded in the CRC and the Guidelines outlines that any care option must respect the rights and best interests of the individual child and cater to his/her specific needs, characteristics, situation and, as far as possible, wishes. This means that a full range of quality alternative care options needs to be put in place. Children and their parents should have access to universal services as well as targeted support for families and children at risk in order to prevent children’s unnecessary separation from their parents. Children with disabilities, as explicitly referred to in article 23 of the UNCRPD, must not be separated from their parents on the basis of a disability of either the child or one or both of the parents. In case that such a separation is necessary and in the best interests of the child, every effort should be undertaken to provide alternative care within the wider family, and failing that, within the community in a family setting. As mentioned in article 19 of the UNCRPD, persons with disabilities, including children, should have access to a range of in-home, residential and other community support services which are necessary to support living and inclusion in the community, and to prevent isolation or segregation. Although reforms have taken place in many countries, also with the support of Structural funds, we need to ensure that Member States work for the long-term inclusion of children with and without disabilities in the society. Regular monitoring of the use of Structural funds is key to funds being used in the best interest of children and we welcome this being mentioned in the Council conclusions. Civil society and service users should be part of this monitoring as it is stated in the European Code of Conduct on Partnership.